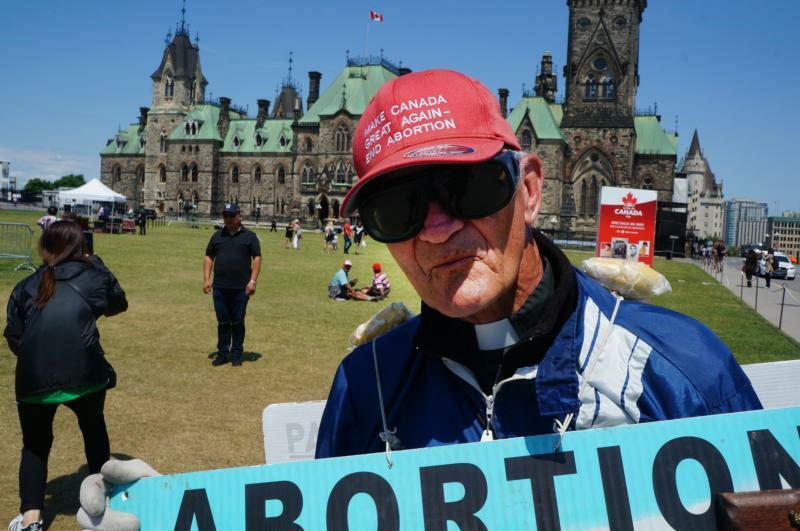 OTTAWA, Ontario (CNS) — Jesuit Father Tony Van Hee says nearly three decades spent fasting and praying on Parliament Hill to end abortion have been the best years of his life. At age 81, he has no plans of slowing down, despite a raft of rule changes that, among many restrictions, even limit his bathroom breaks. “I have a need for solitude and the contemplative life of prayer and, oddly enough, I get that on Parliament Hill,” said the priest, a fixture on the Hill every day the House of Commons is in session, rain, shine, sweltering heat or even the bitter cold and snow of an Ottawa winter. Father Van Hee’s prayer-and-fasting ministry began in 1989 through Operation Rescue, a pro-life organization that used civil disobedience to protest abortion. He was inspired by the example of Kurt Gayle, a leader of Operation Rescue in Canada, who came to Parliament Hill in the summer of 1988 to protest the Supreme Court’s Morgentaler decision, which struck down Canada’s abortion law. “He and another fellow fasted for 19 days and put a balloon up in the air every five minutes to signify an abortion was taking place in Canada,” Father Van Hee said. He joined Gayle on the Hill in 1989 to fast and pray. When Gayle had to leave after 29 days to attend to a sick daughter, Father Van Hee continued the vigil. Thirty years later, he is still coming back. That optimism was based on legislation before Parliament in 1989 intended to limit abortion, but the bill failed to pass in a close vote. To this day there is still no law in Canada to prevent an abortion at any point in a pregnancy. What instead has emerged are regulations that target protesters. Ontario and British Columbia have bubble-zone laws to keep pro-life demonstrators — even people quietly praying — at least 50 meters away from abortion facilities. And rules have become much tighter on Parliament Hill for individual demonstrators due to a greater emphasis on security in the wake of terrorism threats. Gone are the days Father Van Hee could sit in a lawn chair with several signs propped up in the grass around him or stand with signs near the door at Centre Block, where Members of Parliament enter. In the 1990s, he could chat with legislators as they arrived and use the washroom inside whenever he wanted. Today, Father Van Hee needs a permit for his solitary protest, which he renews every three months, to take his position not far from the Centennial Flame on Parliament Hill from 9 a.m. to 3:30 p.m. He’s only supposed to display one sign, but he wears a sandwich-board loosely tied across his shoulders. So far no one has opposed his two-sided display. Protesters must stand, not sit, always hold their sign and never leave it unattended. Thus, Father Van Hee is reluctant to leave his spot even to use the restroom. He uses a flexible stool to help support him during the long days. He has experienced confrontations. Although most of his interactions are positive, Father Van Hee has been spat at and accosted. Once, after a verbal exchange, a member of Parliament grabbed his sign and threw it over a wall. A Royal Canadian Mounted Police officer asked if the priest wanted to press charges, and several members of Parliament came to the priest’s defense, but he decided to let it pass. He had a soft spot for that legislator, he said, because the lawmaker had come to his defense on freedom-of-speech grounds one time when the priest was arrested. Though aware of recent court decisions and legal restrictions on religious freedom and freedom of expression, Father Van Hee said he cannot be bothered with legal arguments in the fight for the unborn. With the House of Commons on summer break, Father Van Hee’s vigils are on hold. But he plans to spend a week with a group called Show the Truth, which displays large, graphic anti-abortion signs at busy intersections. “I offer Mass for them each day and I participate in the demonstrations, too,” he said. The priest said he has no problem with graphic signs.